I’m a self-taught, independent illustrator and graphic artist with a passion for web technology and cartooning. 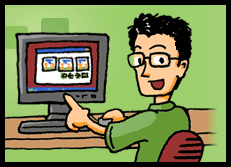 Since 2006, I’ve published my cartoons and comics to the web and marketed my work independently. Beyond my comics, I’ve done freelance web design and web graphics, print artwork, commissioned illustrations, t-shirt designs, and more. I take pride in creating a polished product for my clients, whether it’s marketing materials to communicate visually with their customers, or a piece of artwork for personal enjoyment. You can count on me to deliver quality artwork and graphics when you need them. So, what can I do for you? If you have any opportunities you’d like to discuss with me, please email jacksonpferrell -at- gmail -dot- com.